Black and white negative showing the Whitby lacrosse team. They defeated the Uxbridge/Beaverton team by a score of 2-3. Back row: Frank Bryan, William Rooke, David Mathison, Guy Dartnell, C. Crowley, Charles Snow, W. Ritchie, W.C. Mitchell, Ezekiel Richard Blow. Front row: William Tannery, George Barnes, unidentified, Theodore King, Major Anson G. Henderson (manager), Oliver Sebert (captain), Tony Bandel (umpire). 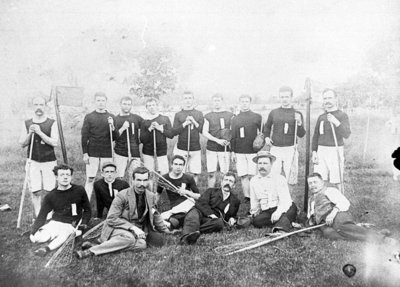 Whitby Lacrosse Team, 1893, H.G. Thompson. Whitby Archives 21-016-017.